In this week's edition of Unearthing the Metal Underground, we'll revisit the country of Chile again - a land with a scene that is so vast and devout that one could do a column on it every week. I respect the Chileans since they are fervent supporters of their metal scene with how they pack their clubs and buy music. In fact, looking at the Chilean scene is observing one with both plenty of new talent and veteran acts just now getting their due. The Chilean scene dates back to the eighties, much like ours. In gaining an overview of it all, it is best to see it through the eyes of a Chilean old schooler. One of the most visible scene veterans, Digmetalworld honcho Ignacio Orellana, has seen a great deal of it since he picked up his first pair of drumsticks at the age of 14. 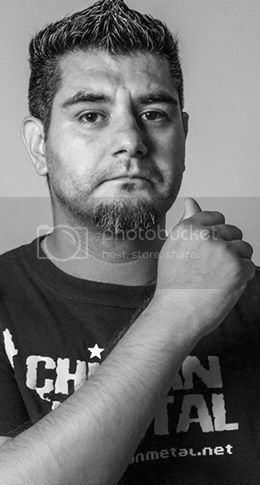 The Santiago native thus began his journey into being a metal drummer and all-around metal music fanatic. Teenage Ignacio quickly caught up with the new releases in a scene that boasted a demo tape from Massakre two years earlier in 1985. Various other metal bands existed, but tape trading was done on the down low. These were the years of Augusto Pinochet's military junta, a period in which metal was seriously frowned upon by the government. By the time Pinochet's 17 year regime ended with him handing over power to president-elect Patricio Aylwin in 1990, artistic expression became more relaxed. Chilean metalheads could now go to clubs without being searched for drugs and alcohol, or without being jailed for sedition. Orellana remembers these hard times as his own, he being one of thousands of music fans listening to thrash to forget and pass the time. MTV Latino then began showing indie metal videos and radio stations began playing metal on their rotation. The arrival of German act Kreator in April of 1992 paved the way for international shows. Some of the earliest record labels in Chile were Toxic and Piccoroco records (the label of the now-deceased Nimrod drummer), along with the Australis and Negative Entertainment companies in Santiago. The former still exists, even boasting doom-death band Lapsus Dei's new album "Sadness Reflections" on it. The desert north had its own representation with Agresor records, while Patagonia gave rise to Rawforce. Being of limited means and still separated from the rest of the world pre-internet, it was hard for any of these offshoots to become a big contender like the well-known independent stateside and European labels. In these times, some Chilean metal musicians moved abroad and took plenty of opportunities to get exposure and make a name for themselves, Ignacio included. Orellana (pictured on the right) had family members in upstate New York, deciding to move to Poughkeepsie in 2002. He had a wife, one daughter and also considered himself pretty much 'married to heavy metal.' He did have a vision, one that he continues to see through to this day. He had his band Pirosaint and started giving serious thought to ressurecting it when one day, two years later, a guitarist from the band Bing Bling Blang asked him via the musician want ads to gig in his band. Somehow, though, his bigger calling was to represent Chilean metal. His first major undertaking was to create the Chilean Metal website, a catalyst for everything else he was about to do. From that came Digmetalworld, his large distribution/label site, which grew from featuring all Chilean band streams/downloads to even include some Swedes, Brazilians and Russian acts. He has diversified into his own Spanish language news sites such as Boca Sucia and Latin Rocker, as well as starting the digital distributor KulMusic records. Having his heart in the club scene, Ignacio created ArmyOfOneTV, an interview series that features nearly any band that stops through his neck of New York. These days, the Chilean bands are gaining a wider audience due to dedicated people such as Ignacio. As he occupies himself in his home studio, uploading the latest releases from Lefutray, Huinca and other Chilean acts to his Digmetalworld bandcamp page, he reflects on the musical metamorphosis that his country has made. The expat admits that the dream of musicians in his country isn't necessarily to be part of some big label, but to play the music they love. Today on Metal Underground, in featuring three bands from Chile, we'll focus on a couple that have the legacy of being old school. We will also check out another from Orellana's Digmetalworld site. Older and newer acts share the stage in this scene with a great level of acceptance. These Chilean artists, however divergent their genres and backgrounds may be, come together on sites such as Chilean Metal. Their common bond of nationality is what fosters their scene into something greater. It is great to see Francisco Cautin still in the game a quarter century later. Back in 1989, the bassist/vocalist gave rise to the band and named it Torturer after the injustices the Chilean populace suffered at the hands of the military government. Counting seven releases under its belt if you include EP's, splits and compilations, Torturer has been ostensibly absent for a decade since the "Flames of Purification" full-length release. They did a 'best of' album in 2009 titled "Los Ultimos Tiempos" and a split a year earlier, with Francisco insisting that a new double album was imminent in this interview. The new material will eventually come, as Torturer has a new home on the Chilean label Rawforce. Things did come full circle back home from the days where Torturer was a rarity for signing onto a French record label and then an Australian one - making them one of the first metal Chileno acts to get recognized beyond their borders. Torturer - "Oppressed by the Force"
We're talking old school here. It seems completely patronizing for me to 'unearth' these legends, since it's like unearthing Venom in England. But, the fact remains that Chile's Pentagram has a huge cult following in South America while still virtually unknown here, possibly because of name confusion with a well-known doom act. These Santiago death metal pioneers did a couple of three-song demos back in the eighties. Lead vocalist/guitarist Anton Reisenegger then travelled to Brazil to meet his tape trading buddies Igor and Max Cavalera. He was even offered a record deal for Pentagram, but the correspondence in the mail never got to him and it wasn't to be. Eventually, Reisenegger and even another member went overseas and took other offers - Anton as bassist for Swedish dark metallers The Gardnerz. One became a vocal coach in Barcelona, Spain. Another became an underground fixture by staying in Chile and joining Arkham and then progressive act Dorso. Twenty years later they staged a reunion, the newly energized trio finally releasing its first full-length album "The Malefice" on Cyclone Empire records September 6th of this year. Check out the scream one and a half minutes into "La Fiura" - it's none other than Marc Grewe from Morgoth. One of the latest metal/rock entrants from the Chilean scene that has made it's way onto Digmetalworld's streaming platform is the popular capital city act Fuka. Formed in 2008, Fuka honed its sound toward more chorus/riff metal rock anthems with that trademark Latino groove. 2009 saw the release of the "Crudo" EP, plenty of gigs, and a stable line-up that saw the quartet through until the debut full-length was released in 2012. Titled "En Guerra," the nine song endeavor was heavier hitting musically and quite catchy. The band still hasn't left Chile and played a foreign gig, but that is bound to change. Fuka - "Cierra los Ojos"
Take the time to explore more Chilean metal, a scene with a rich history and a vast number of diverse, independent metal bands. Also revisit us once again on Mondays when we unearth yet another genre or location here on Metal Underground. Vicky Willis has been a freelance journalist and former college radio disc jockey for almost twenty years. She has been contributing to Metalunderground.com since 2010. 1 Comment on "Unearthing The Metal Underground in Chile Pt. 2"